Buon giorno and welcome to Stefano’s RomeCabs, Rome’s leading company for Civitavecchia Cruise Port Transfers and Cruise Port Tours. In this travel blog, we cover the types of Civitavecchia Cruise Port Transfers you may need if you will be in Rome pre cruise or post cruise, including helpful tips and advice. If you plan to arrive in Italy on the the same day your cruise ship departs from Civitavecchia, you would require a transfer from Fiumicino Airport (FCO) to Civitavecchia. If you arriving a day early prior to your ship departure and are planning to stay in the town of Civitavecchia near the port overnight, you may book the same type of transfer and just select to be taken to your hotel in Civitavecchia instead of the Cruise Port. By car is the most direct, fast, and hassle free way to reach Civitavecchia from FCO Airport. Your RomeCabs Driver will meet you at the Designated Meeting Point, accompany you to your waiting vehicle, and in about 1 hour or so you will arrive at your ship. With pier-side service, you will be taken directly to your ship, no need to take cumbersome port shuttle buses. If flying into Italy on the same day your ship departs, plan a morning flight arrival so you have plenty of extra time in case you miss your connection flight, experience flight delays, or encounter delays in customs or baggage claims issues. If you are in Rome prior to your cruise, you may book a transfer from your Rome accommodation to your ship in Civitavecchia. Direct travel time by car is about 90 minutes from Rome to Civitavecchia. Your RomeCabs driver will meet you in the lobby of your hotel or at your apartment address, and take you directly to your ship for convenient and easy door to door service. Book your transfer at any time between 11:00 AM (the earliest) to 1:00 PM (the latest) as this is the most common time range for port transfers from Rome. Wish to save money on your Civitavecchia Port Transfer? Find out about Privately Shared Port Transfers and create your own privately shared transfer with fellow cruisers also staying in central Rome pre cruise and going to the same ship as you. If your flight departs on the same day your ship arrives at the end of your cruise, you will require a transfer from your cruise ship to the airport. Your RomeCabs Driver will meet you right on the pier next to your ship holding a sign with your name, and within about 1 hour you will arrive at the airport. To be safe, do not book your flight too early in the morning. The earliest recommended is usually 11 AM – 12:00 PM so you have plenty of time in case you experience any delays with the ship docking late, or delayed disembarkation. Find out about Privately Shared Port Transfers, and create your own privately shared transfer with fellow cruisers from your cruise ship who are also going to Fiumicino Airport or a Fiumicino Hotel. If you plan to stay in Rome post cruise, you may book a transfer from your cruise ship in Civitavecchia to your hotel accommodation in Rome. The most common pick up time from the cruise ship going to Rome hotel is 8:00 AM to 9:00 AM as this is the time frame most cruisers are disembarked by. If you have a late disembarkation pass from your cruise ship, you may schedule your pick up later in the morning past 9 AM. Otherwise if you schedule your pick up too late in the morning such as 10 AM or later, you may risk being disembarked much earlier and having to wait on the pier for your scheduled pick up time if last minute change in pick up time is not available. Find out about Privately Shared Port Transfers, and create your own privately shared transfer with fellow cruisers from your cruise ship also going to central Rome hotels. Are you in Rome for just a short time Pre Cruise and Post Cruise and wish to make the MOST of your limited availability to enjoy more of Italy before and/or after your cruise? Find out more about our Pre Cruise and Post Cruise Tour options and maximize your sightseeing opportunities. Enjoy a fun filled morning touring Rome or the charming Roman Countryside with pick up from your hotel and drop off right at your ship in time for embarkation. Enjoy a Full day Tour of Rome or the Roman Countryside starting from your cruise ship in Civitavecchia and ending at your hotel in Rome in the afternoon. Any shore excursion from Civitavecchia can be converted into a post cruise tour option. Post Cruise Tours are also ideal if you have an late afternoon or evening flight from Rome’s Airport in Fiumicino, giving you the opportunity to enjoy a full day of touring the best of Rome or the countryside before your trip home. If your cruise ship also docks in Livorno, La Spezia or Naples cruise ports we offer full day shore excursions from these main cruise ports to many of Italy’s top destinations. Visit our website, or our sister company Stefano Rome Tours for a wide variety of exciting shore excursions from Italy’s cruise port. Thank you very much for reading our travel blog Types of Civitavecchia Cruise Port Transfers you may Need . We invite you to please visit our website below for more information about our Civitavecchia Transfers, Pre Cruise Tours, Post Cruise Tours, and Shore Excursions. The Medieval hamlet of Ceri is one of the most delightful tiny villages in central Italy and featured on our popular day tour from Rome and shore excursion from Civitavecchia: COUNTRYSIDE SPLENDOR. Located in the Roman countryside about 1 hour from Rome and about 45 minutes from Civitavecchia Cruise Port, Ceri is a very popular destination for visitors, cruisers and locals for many reasons! When you arrive in Ceri through the rustic countryside, you will come face to face with a steep tuffa cliff with the remains of a medieval era fortress (fortified defense walls) that gives the incredible impression that the village rises right out of the cliff! The unique rock formation of the cliff offered a natural defense from enemy attacks, and local ancients have settled here since the pre-Roman Etruscan era around 7th century BC. Following the Roman conquest of the Etruscans, the Romans settled here as well – as discovered in numerous Etruscan and Roman nearby tombs. Accessible only via the original medieval single lane wide street that enters through the main arched gateway, and continues upward flanked by tall stone buildings from the bottom of the cliff to the top of the village square, you find yourself feeling you’ve just traveled back in time a thousand years! Traffic is controlled through a stop light at the top and the bottom, and vehicles take turn driving up and down as 2 vehicles cannot fit on the street meant for medieval horse pulled wagons, not modern day vehicles. The village that we see today was founded in year 1236 when nearby locals abandoned their town of Caere for the better protected clifftop location, and named it Caere Novum (New Caere), to differentiate it from the previous Caere Vetus which nowadays is known as Cerveteri. Once you arrive on the top, you’ve reached the town square that’s surrounded by historic buildings and the 12th century Church of the Madonna di Ceri. The church merits a visit, even if on the outside it appears austere. This Romanesque church was built on top of an ancient site (possibly a temple) where the ancient Etruscans and Romans who occupied this site venerated the goddess Vesta. Inside, you will be amazed at the recently discovered original Medieval frescoes that graced the church walls depicting scenes from the Old Testament. Since the 14th century Ceri changed hands as it became the property of some of Italy’s most illustrious and famous families like Anguillara, Cesi, Borromeo, Odescalchi, and Torlonia. Ceri is also well regarded in Italy for its family owned restaurants that serve some of the region’s most delicious traditional cuisine using fresh and in season local ingredients and secret recipes passed down from generation to generation. You may visit Ceri on our COUNTRYSIDE SPLENDOR Full Day Countryside tour from Rome and from the Cruise Port of Civitavecchia, and our PRE CRUISE COUNTRYSIDE TOUR from Rome to Civitavecchia. 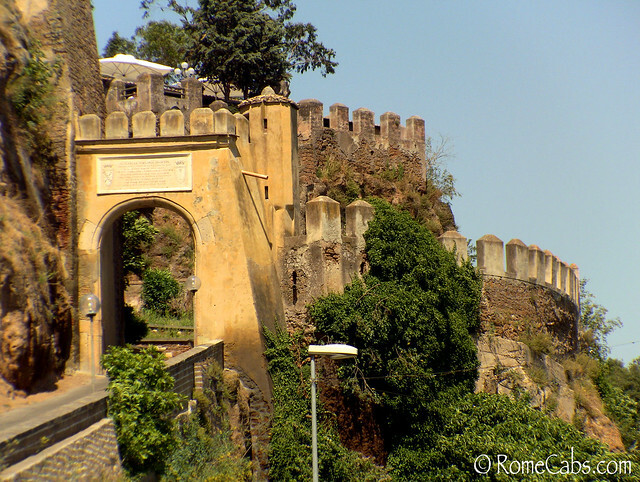 Thank you very much for reading our Medieval Hamlet of Ceri – Postcard from RomeCabs travel blog. Please visit our website for more tours and transfers in Rome and around Italy. Buon giorno and welcome to Stefano’s RomeCabs, Rome’s leading company for quality private transfers and tours. Ponte Vecchio (The Old Bridge) is one of the most famous Medieval bridges in Italy. Believed to have been originally built by the Romans when the Roman Via Cassia road traversed the Arno River, it was destroyed and and rebuilt a number of times. It was last rebuilt in 1345. In 1966 the bridge was severely damaged in the Great Flood of Florence of 1966. Arching across the Arno River in the heart of Florence, Ponte Vecchio is a closed stone bridge lined with shops and topped with the 16th century Vasari’s Corridor that connects Palazzo Vecchio (Florence town hall in Piazza della Signoria) to Palazzo Pitti commissioned by the powerful Medici family. This corridor was used by the Medici family and their associates to safely access their residential palace and Palazzo Vecchio. The bridge hosted merchants ever since the Medieval times, although monopolized by butchers who made the bridge less inviting with offensive odor. The Medici forced the removal of the butchers and were soon replaced by goldsmiths – a tradition you see even today as the shops that line Ponte Vecchio are primarily jewelry shops. When the jewelry shops close, their wooden panels are drawn down to give them the resemblance of charming ancient wooden jewelry boxes. Ponte Vecchio also honors Florence’s celebrated sculptor and goldsmith Benvenuto Cellini with a large bronze bust. A stroll along Ponte Vecchio is a must when visiting Florence. You would have the opportunity to do so on our Florence in A Day Tour from Rome or our shore excursions from Livorno and La Spezia to Florence and Pisa. We thank you very much for visiting our blog, we look forward to welcome you to Italy! Buon giorno and thank you for visiting Stefano’s RomeCabs Transfers and Tours Travel Blog. In this Postcard from RomeCabs series, we feature the Umbrian town of Assisi that rests peacefully high up on the slope of Mount Subasio. Most often recognized as the birthplace of Saint Francis and Saint Claire, Asisis is a magical hilltop town is one of the most beautiful medieval settlements in Italy. Retaining its original stone style of medieval architecture built of pale grey and pink stone quarried nearby, Assisi is so well preserved that it still looks brand new – not a town that’s at least 1,000 years old. Both RomeCabs and Stefano Rome Tours offer day tours to Assisi that also includes a visit to Santa Maria degli Angeli – the famous cathedral in the town by the same name located at the foot of Assisi. Santa Maria degli Angeli church houses the famous Porziuncola ( a tiny stone church where the Franciscan movement started), and is respected at the place where Saint Francis passed away on October 3, 1226. The Saint Francis Basilica consists of a Lower Level and Upper Level and it includes spectacular vibrant frescoes by the masters of that time, Giotto and Cimabue. The construction of the basilica started immediately after the canonization of Saint Francis in 1228 on a plot of donated land on the west hillside of Assisi known as “Colle d’inferno” (Hill of Hell) as criminals were previously executed there. After the construction of the Basilica, it became known as the “Hill of Paradise”, blessed by the presence of the Saint’s body that is buried in a tomb beneath the basilica. The simple basilica of Saint Claire houses the remains of Saint Clare beneath the high altar. Also notable, is the large cross that originally hung in the once decrepit San Damiano monastery that is believed to have spoken to Francis and helped in his conversion from a life of debauchery to monastic. Also featured in the basilica are preserved personal articles that once belonged to Saints Francis and Claire. San Damiano Convent is significant for the Franciscans as this is where young Francis first received his calling when, as tradition recalls, a large crucifix hanging inside the church (now found inside the Basilica of Saint Claire) spoke to Francis and called on him to rebuild His church. Taking the command literally, young Francis began to rebuild it stone by stone. It wasn’t until later that the meaning could have been interpreted as rebuilding the spiritual aspect of the church which was considered corrupt in those days. This rebuilt church was later expanded to become the convent of Saint Claire, the first female follower of Saint Francis and the founder of the Order of the Poor Clares. Saint Claire lived and died here at the San Damiano convent. The Church of Santa Maria Sopra Minerva, located in the town’s main square, Piazza del Commune, is quite fascinating as it was built inside a 1st century BC Roman pagan temple dedicated to goddess Minerva. The church was built in 1539, but it was renovated in a highly ornate Baroque style in the 17th century that gives the small church the appearance of a jewelry box of gold and powder blue. Whether you visit Assisi by on an extend stay, or if you take a Day Trip, it is one of the most impressive, peaceful, and spiritual Medieval towns in Italy. The festival features multiple eras that are part of the region’s historic fabric: Etruscan Era, Roman Era, Medieval Era, and Renaissance Era. Each historical time is situated in different locations in the town created to fit the theme. The park near the Cathedral and the Medici Fortress showcased the Medieval Era with Medieval games, chivalry competitions, sword fighting, jousting, music, and a Medieval Village where many groups set up their own camps under large white fabric tents and canopies. The Medieval Village was particularly interesting since sometimes visitors just observe authentically costumed participants interacting in their own camps as they might have in the Medieval times: start a cooking fire, sharpen their tools, eat at the communal picnic-like tables, or make things by hand. At other other times, visitors were invited to step into the camps to mingle with the re-enactors and learn about the Medieval life, the tools used, and crafts they made. Unlike the opulent Renaissance era with rich vibrant fabric clothing, large feathered hats, and expensive looking boots and accessories, the Medieval era was very simple and monochrome. The clothing were simple and earth toned (fabrics likely dyed with plants), and with metals very expensive for the average person, items like swords and mallets were a commodity. While a Renaissance era dweller may have sported a sword at his hip for self defense, his medieval counterpart may have used a scythe as a defense weapon. By 14th century wealth began to flow into Italy as Europe began to experience economic growth due to new trade routes on land and sea that linked Italy’s ports to other networks in Europe. Cultural and architectural achievements throughout Europe opened the opportunity for the Renaissance (re birth) to flourish in Tuscany. The dark Medieval architecture of wood was rebuilt into large palaces with marble facades. The stark Medieval life of survival and ignorance was transformed into a life of plenty and enlightenment. It is quite interesting to see these 2 consecutive eras beautifully juxtaposed just a short distance from each other in Arezzo. 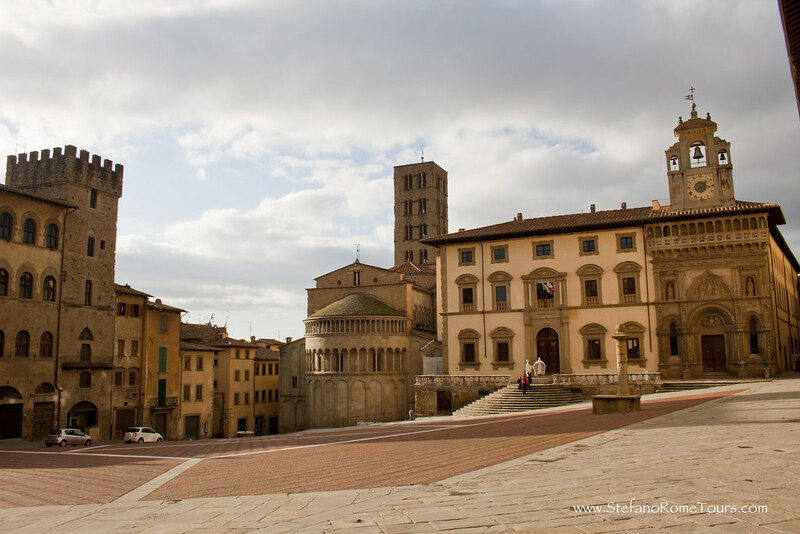 Arezzo is also part of Stefano Rome Tours UNDER THE TUSCAN FUN tour that takes you on a fun filled journey through Tuscany to visit Arezzo and Cortona. In this week’s Video Postcard from RomeCabs, we are featuring the first of a few spectacular vignettes from one of Italy’s greatest historical festivals that revisits 4 incredible eras in Italy’s history: Etruscan, Roman, Medieval and Renaissance. It does just that! It takes the visitors back in time to all of these incredible eras as hundreds of talented re-enactors and professionals recreate pieces of history for us to enjoy. This Video Postcard features a Renaissance Court dance performed outdoors by a group of talented and well costumed dancers show us the moves their ancestors have mastered centuries ago. The Renaissance era was a time where wealth propelled advances in art, music, science, philosophy, medicine, and technology. This period changed the face of humanity and still inspires it today. You can easily recognize this age of opulence in the flamboyant fashions where fine colorful fabrics and bulked clothing adorned the well off. Court dancers were primarily upper class nobility such as Kings, Queens, Dukes, Duchesses, Lords, and Ladies. On festive occasions and banquets, the courtiers danced in couples or groups, displaying grace and dancing abilities in their finest costumes. Dancing schools were created where the dance masters taught dance classes at court to those who aspired to a higher social status and impress their peers. Many small steps created patterns, some steps included jumping on the right foot and kicking the left foot to the front, slide the feet, tapping, stomping, circling about and more. By the 16th century, more instruments such as the violin were added to the the small orchestra that provided music to the dances. As time passed through the Renaissance into the Baroque eras, both the dances and instruments became more complex. It is said that the love and passion for court dancing didn’t disappear…. It was replaced by ballroom dancing. Thank you very much for visiting our blog, and stay tuned for more Video Postcards and vignettes from Italy and it’s fascinating places and events. For more information on AREZZO: BACK IN TIME, visit their official website. 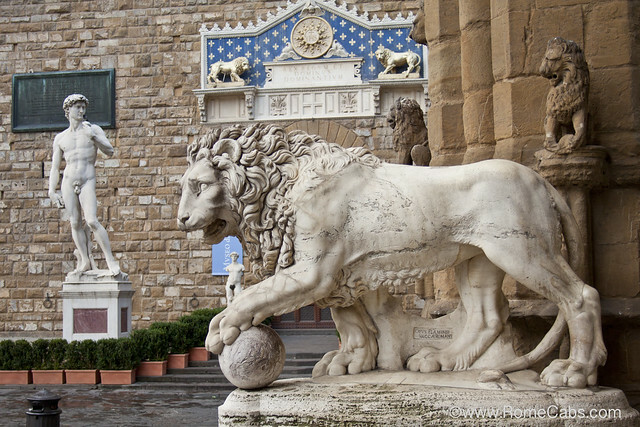 Arezzo is also part of the “UNDER THE TUSCAN FUN” tour provided by our sister company Stefano Rome Tours.